Betsy is the younger sister. Though Sally thinks that sums her up, it turns out there is a little more. Betsy lives among the chaos and tumult of a household filled by a husband, three children, two poodles and, until recently, a cute little convertible that turned out to be a lemon. That car was the embodiment of Betsy’s failed mid-life crisis. She’s not done being a mom, despite what she thought during an impulsive moment at a car dealership. Her husband, Big Wave Dave, has figured out how to combine a career as a real estate developer with a career as a coach for every sport played by every child in every suburb during every season. In his spare time, he watches all professional sporting events and manages large numbers of small bets with friends throughout the country. All of this drives Betsy insane. Her children include a teen-age daughter who has been a vegetarian since age five, a teen-age son who enjoys celebrity status in the community as the most amiable middle-school boy ever to have walked the earth, and a nine year old son who has memorized every American president and vice-president, as well as all details of every administration. The youngest also happens to have been born blind, which makes Betsy an expert in the area of raising a child with special needs. Her poodles are members of her family who require more attention, more medication, and more specialists than anyone can imagine. Normalcy and reason are not part of the Betsy equation. 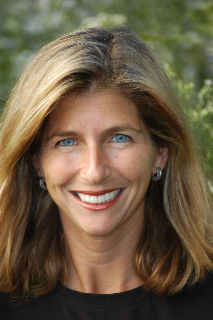 After graduating from Cornell University, Betsy worked in the hospitality industry as a Sales Manager for Hyatt Hotels, as a consultant at Laventhal & Horwath, and as Director of Purchasing at Tennis Corporation of America. Though she has formally left all of these positions, she still thinks of herself as the world’s foremost authority on purchasing… everything. As co-host of Walking on Air with Betsy and Sal, Betsy is thrilled to be listed first in the title. She prides herself on being able to talk intelligently about all subjects, whether she knows about them or not. She also believes in the credo that it’s easy to parent as long as you are willing to throw your principles out the window. Betsy can be reached at her desk every morning at 4 a.m.